PAL, short for Phase Alternating Line, is an analogue television colour encoding system used in broadcast television systems in many countries. Other common analogue television systems are NTSC and SECAM. This page primarily discusses the PAL colour encoding system. The articles on broadcast television systems and analogue television further describe frame rates, image resolution and audio modulation. For discussion of the 625-line / 50 field (25 frame) per second television standard, see 576i. In the 1950s, the Western European countries commenced planning to introduce colour television, and were faced with the problem that the NTSC standard demonstrated several weaknesses, including colour tone shifting under poor transmission conditions. To overcome NTSC's shortcomings, alternative standards were devised, resulting in the development of the PAL and SECAM standards. The goal was to provide a colour TV standard for the European picture frequency of 50 fields per second (50 hertz), and finding a way to eliminate the problems with NTSC. PAL was developed by Walter Bruch at Telefunken in Germany. The format was unveiled in 1963, with the first broadcasts beginning in the United Kingdom and West Germany in 1967, - the one BBC channel initially using the broadcast standard was BBC2 which had been the first UK TV service to introduce '625-lines' in 1964. Telefunken PALcolor 708T was the first PAL commercial TV set. It was followed by Loewe S 920 & F 900. The term PAL is often used informally and somewhat imprecisely to refer to the 625-line/50 Hz (576i) television system in general, to differentiate from the 525-line/60 Hz (480i) system generally used with NTSC. Accordingly, DVDs are labelled as either PAL or NTSC (referring informally to the line count and frame rate) even though technically the discs do not have either PAL or NTSC composite colour. The line count and frame rate are defined as EIA 525/60 or CCIR 625/50; PAL and NTSC are only the method of embedding colour in the transmission. Both the PAL and the NTSC system use a quadrature amplitude modulated subcarrier carrying the chrominance information added to the luminance video signal to form a composite video baseband signal. The frequency of this subcarrier is 4.43361875 MHz for PAL, compared to 3.579545 MHz for NTSC. The SECAM system, on the other hand, uses a frequency modulation scheme on its two line alternate colour subcarriers 4.25000 and 4.40625 MHz. The name "Phase Alternating Line" describes the way that the phase of part of the colour information on the video signal is reversed with each line, which automatically corrects phase errors in the transmission of the signal by cancelling them out, at the expense of vertical frame colour resolution. Lines where the colour phase is reversed compared to NTSC are often called PAL or phase-alternation lines, which justifies one of the expansions of the acronym, while the other lines are called NTSC lines. Early PAL receivers relied on the human eye to do that cancelling; however, this resulted in a comb-like effect known as Hanover bars on larger phase errors. 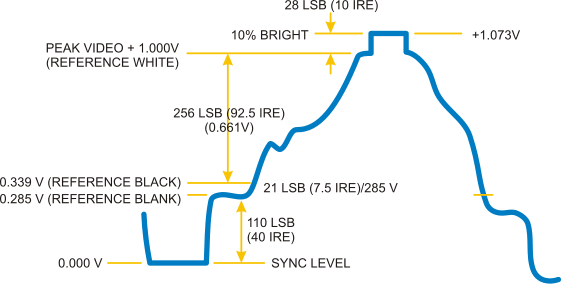 Thus, most receivers now use a chrominance delay line, which stores the received colour information on each line of display; an average of the colour information from the previous line and the current line is then used to drive the picture tube. The effect is that phase errors result in saturation changes, which are less objectionable than the equivalent hue changes of NTSC. A minor drawback is that the vertical colour resolution is poorer than the NTSC system's, but since the human eye also has a colour resolution that is much lower than its brightness resolution, this effect is not visible. In any case, NTSC, PAL, and SECAM all have chrominance bandwidth (horizontal colour detail) reduced greatly compared to the luminance signal. Oscillogram of composite PAL signal - one frame. 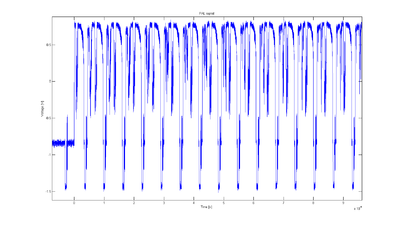 Oscillogram of composite PAL signal - several lines. Oscillogram of composite PAL signal - two lines. The 4.43361875 MHz frequency of the colour carrier is a result of 283.75 colour clock cycles per line plus a 25 Hz offset to avoid interferences. Since the line frequency (number of lines per second) is 15625 Hz (625 lines x 50 Hz / 2), the colour carrier frequency calculates as follows: 4.43361875 MHz = 283.75 * 15625 Hz + 25 Hz. The original colour carrier is required by the colour decoder to recreate the colour difference signals. Since the carrier is not transmitted with the video information it has to be generated locally in the receiver. In order that the phase of this locally generated signal can match the transmitted information, a 10 cycle burst of colour subcarrier is added to the video signal shortly after the line sync pulse, but before the picture information, during the so called back porch. This colour burst is not actually in phase with the original colour subcarrier, but leads it by 45 degrees on the odd lines and lags it by 45 degrees on the even lines. This swinging burst enables the colour decoder circuitry to distinguish the phase of the R-Y vector which reverses every line. In most cases, NTSC is used with a fps of 60i or 30p, so theoretically offers very slightly smoother motion than PAL, which is generally used with 50i or 25p. The difference is negligible, however, and artefacts caused by frame rate conversion required when video has been recorded at the wrong rate for the display are more severe. However, the alternation of colour information — Hanover bars — can lead to picture grain on pictures with extreme phase errors even in PAL systems, if decoder circuits are misaligned or use the simplified decoders of early designs (typically to overcome royalty restrictions). In most cases such extreme phase shifts do not occur. This effect will usually be observed when the transmission path is poor, typically in built up areas or where the terrain is unfavourable. The effect is more noticeable on UHF than VHF signals as VHF signals tend to be more robust. 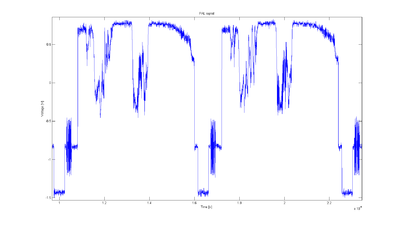 SECAM transmissions are more robust over longer distances than NTSC or PAL. However, owing to their FM nature, the colour signal remains present, although at reduced amplitude, even in monochrome portions of the image, thus being subject to stronger cross colour. Like PAL, a SECAM receiver needs a delay line. After 0.9 µs a 2.25±0.23 µs colorburst of 10±1 cycles is sent. Most rise/fall times are in 250±50 ns range. Amplitude is 100% for white level, 30% for black, and 0% for sync.The CVBS electrical amplitude is Vpp 1.0 V and impedance of 75 Ω.
and are used to transmit chrominance. Each has a typical bandwidth of 1.3 MHz. 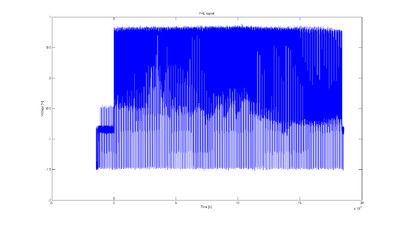 Composite PAL signal timing where . Subcarrier frequency is 4.43361875 MHz (±5 Hz) for PAL-B/D/G/H/I/N. ** The UK's adoption of 582 active lineshas no significant impact on either non system I receivers or non system I source material as the extra lines are not within the normal display area and do not contain anything in the other standards anyway. All Digital TV broadcasts and digital recordings (e.g. DVDs) conform to the 576 active line standard. The majority of countries using PAL have television standards with 625 lines and 25 frames per second, differences concern the audio carrier frequency and channel bandwidths. Standards B/G are used in most of Western Europe, Australia and New Zealand, standard I in the UK, Ireland, Hong Kong, South Africa and Macau, standards D/K in most of Central and Eastern Europe and Standard D in mainland China. Most analogue CCTV cameras are Standard D.
Systems B and G are similar. System B is used for 7 MHz-wide channels on VHF, while System G is used for 8 MHz-wide channels on UHF (and Australia uses System B on UHF). Similarly, Systems D and K are similar except for the bands they use: System D is only used on VHF, while System K is only used on UHF. Although System I is used on both bands, it has only been used on UHF in the United Kingdom due to 405-line TV services on VHF operating until the 1980s. In Brazil, PAL is used in conjunction with the 525 line, 29.97 frame/s system M, using (very nearly) the NTSC colour subcarrier frequency. Exact colour subcarrier frequency of PAL-M is 3.575611 MHz. Almost all other countries using system M use NTSC. The PAL colour system (either baseband or with any RF system, with the normal 4.43 MHz subcarrier unlike PAL-M) can also be applied to an NTSC-like 525-line (480i) picture to form what is often known as "PAL-60" (sometimes "PAL-60/525", "Quasi-PAL" or "Pseudo PAL"). PAL-M (a broadcast standard) however should not be confused with "PAL-60" (a video playback system — see below). In Argentina, Paraguay and Uruguay the PAL-N variant is used. It employs the 625 line/50 field per second waveform of PAL-B/G, D/K, H, I, but on a 6 MHz channel with a chrominance subcarrier frequency of 3.582 MHz very similar to NTSC. VHS tapes recorded from a PAL-N or a PAL-B/G, D/K, H, I broadcast are indistinguishable because the downconverted subcarrier on the tape is the same. A VHS recorded off TV (or released) in Europe will play in colour on any PAL-N VCR and PAL-N TV in Argentina, Paraguay, and Uruguay. Likewise, any tape recorded in Argentina or Uruguay off a PAL-N TV broadcast, can be sent to anyone in European countries that use PAL (and Australia/New Zealand, etc.) and it will display in colour. This will also play back successfully in Russia and other SECAM countries, as the USSR mandated PAL compatibility in 1985 - this has proved to be very convenient for video collectors. People in Uruguay, Argentina and Paraguay usually own TV sets that also display NTSC-M, in addition to PAL-N. Direct TV also conveniently broadcasts in NTSC-M for North, Central and South America. Most DVD players sold in Argentina, Uruguay and Paraguay also play PAL discs - however, this is usually output in the European variant (colour subcarrier frequency 4.433618 MHz), so people who own a TV set which only works in PAL-N (plus NTSC-M in most cases) will have to watch those PAL DVD imports in black and white as the colour subcarrier frequency in the TV set is the PAL-N variation, 3.582056 MHz. Some DVD players (usually lesser known brands) include an internal transcoder and the signal can be output in NTSC-M, with some video quality loss due to the system's conversion from a 625/50 PAL DVD to the NTSC-M 525/60 output format. A few DVD players sold in Argentina, Uruguay and Paraguay also allow a signal output of NTSC-M, PAL, or PAL-N. In that case, a PAL disc (imported from Europe) can be played back on a PAL-N TV because there are no field/line conversions, quality is generally excellent. The PAL colour system is usually used with a video format that has 625 lines per frame (576 visible lines, the rest being used for other information such as sync data and captioning) and a refresh rate of 50 interlaced fields per second (i.e. 25 full frames per second), such systems being B, G, H, I, and N (see broadcast television systems for the technical details of each format). This ensures video interoperability. However as some of these standards (B/G/H, I and D/K) use different sound carriers (5.5 MHz, 6.0 MHz 6.5 MHz respectively), it may result in a video image without audio when viewing a signal broadcast over the air or cable. Some countries in Eastern Europe which formerly used SECAM with systems D and K have switched to PAL while leaving other aspects of their video system the same, resulting in the different sound carrier. Instead, other European countries have changed completely from SECAM-D/K to PAL-B/G. 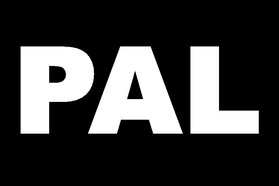 The PAL-N system has a different sound carrier, and also a different colour subcarrier, and decoding on incompatible PAL systems results in a black and white image without sound. The PAL-M system has a different sound carrier and a different colour subcarrier, and does not use 625 lines or 50 frames/second. This would result in no video or audio at all when viewing a European signal. Recently manufactured PAL television receivers can typically decode all of these systems except, in some cases, PAL-M and PAL-N. Many of receivers can also receive Eastern European and Middle Eastern SECAM, though rarely French-broadcast SECAM (because France uses the unique positive video modulation) unless they are manufactured for the French market. They will correctly display plain CVBS or S-video SECAM signals. Many can also accept baseband NTSC-M, such as from a VCR or game console, and RF modulated NTSC with a PAL standard audio subcarrier (i.e. from a modulator), though not usually broadcast NTSC (as its 4.5 MHz audio subcarrier is not supported). Many sets also support NTSC with a 4.43 MHz subcarrier. Many 1990s onwards VCR players sold in Europe can play back NTSC tapes/discs. When operating in this mode most of them do not output a true (625/25) PAL signal, but rather a hybrid consisting of the original NTSC line standard (525/30), but with colour converted to PAL 4.43 MHz - this is known as "PAL 60" (also "quasi-PAL" or "pseudo PAL") with "60" standing for 60 Hz (for 525/30), instead of 50 Hz (for 625/25). Some video game consoles also output a signal in this mode. Most newer television sets can display such a signal correctly, but some will only do so (if at all) in black and white and/or with flickering/foldover at the bottom of the picture, or picture rolling (however, many old TV sets can display the picture properly by means of adjusting the V-Hold and V-Height knobs — assuming they have them). Some TV tuner cards or video capture cards will support this mode (although software/driver modification can be required and the manufacturers' specs may be unclear). A "PAL 60" signal is similar to an NTSC (525/30) signal, but with the usual PAL chrominance subcarrier at 4.43 MHz (instead of 3.58 as with NTSC and South American PAL variants) and with the PAL-specific phase alternation of the red colour difference signal between the lines. Over 120 countries and territories use or once used the terrestrial PAL system. Many of these are currently converting terrestrial PAL to DVB-T (PAL still often used by cable TV or in conjunction with a digital standard, such as DVB-C).